The Short Version: Top10BiDatingSites.com is an all-in-one resource for bisexual and bi-curious singles looking for a platform that best suits their dating style and needs. The site provides users with full reviews and rankings of the best bisexual dating sites. Top10BiDatingSites comes complete with in-depth information, such as pricing, features, and benefits, to help bisexual singles find a welcoming community to explore their needs and sexuality. The site analyzes each platform thoroughly, so users can feel confident in their decisions. While the world is becoming more accepting of various lifestyles, plenty of work remains to be done. Surprisingly, some of the discrimination comes from a place where you’d think there would be the most acceptance: the LGBTQ community. That’s what Clark Ma discovered when he decided to explore his sexuality. “From my experience, gays and lesbians aren’t as accepting of bisexual people, and I don’t know why,” he said. That reality made it hard for Clark to meet people, but he went online and discovered an entirely different quandary. That is when Top10BiDatingSites.com was born. Clark’s need led him to create a resource to help himself and others, and the site is welcoming, inviting all types of users. “Singles, couples, or married men and women can come to our site to explore their sexuality through forums, our blog, websites, and social media,” he said. The site features honest and in-depth reviews of bisexual dating sites, ranking them as a whole, but also giving key insights to help users find a place where they can connect with like-minded daters — rather than wasting time and money on a site that isn’t right for them. Top10BiDatingSites makes finding the right platform easy, especially for singles who don’t want to spend a lot of time researching when they could be meeting new people. Once a user clicks on one of the 10 featured sites, he or she finds a simplified rating on a 5-star scale. The scale rates each site on six different categories, including the chance of getting a date, customer service, privacy protection, features, active members, and value for the money. These categories are tailored to the unique needs of bisexual singles. For instance, if a user wants to go on a date quickly, without a lot of chatting first, a site like BiCupid would suit them well. Clark gives BiCupid 5 stars in the “Chance of getting a date” category. Each review contains much more information for bisexual and bi-curious singles so they can decide quickly. While some users prefer to make decisions based on ratings, others like to do more in-depth research before committing to a dating platform. That research can also save them time, money, and heartache. 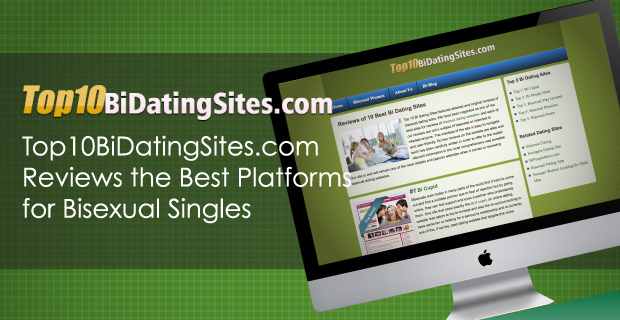 Top10BiDatingSites provides that information through its reviews. Each Editor’s Review is a complete summary of the site’s pros and cons and provides extensive, detailed information. They begin by focusing on the goals and style of each site before moving on to the cost structure and pricing. That information is useful because some sites may charge a monthly fee while others charge for different types of exchanges. The features section is where each site differentiates itself. For instance, BiCupid, the top-ranked site, has an array of unique features, including inviting users to share their first bisexual experience, a dating forum for users to give each other advice, and even a bisexuality counselor for those looking for expert advice. Another site, Bisexual Play Ground, has a diverse membership and chat rooms, while BiFinder has elevated security protocols. Most reviews also contain a pros and cons list, which can serve as a quick rundown of what to expect. Some pros include excellent customer service, a large membership pool, a sense of community, and reasonable pricing. Cons include lack of multiple dating preferences on a profile, premium pricing, low member numbers, or lack of privacy options. Reviews may also touch on the site’s ease of use and navigation, with ratings ranging from savvy to novice. At the end of each review, Clark gives the Editor’s Verdict, which sums up the site in a few sentences. If you don’t want to just take his word for it, you can click on “User Reviews,” and read what other users have to say about each site. Top10BiDatingSites’ blog contains a wealth of advice and knowledge for bisexual and bi-curious singles. The articles are curated for a bisexual audience and deal with important issues. One article, “6 Things Women Need to Know about Dating a Bisexual Man,” discusses common misconceptions about bisexual men, how to talk and connect with them, and also how to invite a man’s bisexuality into a relationship. “Bisexual Gaming and Dating” covers the topic of coming out as bisexual. It provides readers with practical ideas for preparing to come out, such as reading the stories of others who already have. Chatting with others on bisexual websites also helps users gain confidence while preparing to talk with someone. These topics and others included in the blog give singles a good frame of reference and also help build community and a feeling of belonging. Top10BiDatingSites helps connect bisexual and bi-curious singles in an open and accepting environment, and, over the last two years, the site has connected thousands of daters with the resources they need. “Our motto is ‘Love All,’ and we promote that message without any gender differentiation. This is everything we believe in,” Clark said. Top10BiDatingSites is making a difference for bisexual and bi-curious singles who are searching for a community, a platform to find friendship and romance, and a place to explore their sexuality.